There are many different industries that rely on getting a perfect fit hydraulic hose for their hydraulic system. 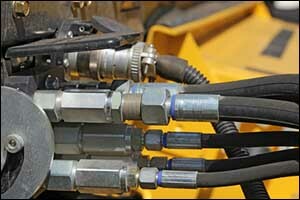 Custom hydraulic hoses are essential for equipment that has hard-to-find or odd-size hoses. Companies who are looking for Greater Fall River hydraulic hoses should take a look at Metro Industrial & Marine Supply in New Bedford. Not only do we have a wide variety of in-stock items at our industrial supply store, but we also do custom hoses while you wait. Many of our custom services are same-day, providing our customers with top quality solutions without having to wait days or weeks for results. We specialize in creating custom hydraulic hoses for our customers. Our team has the capability to create custom made-to-order hoses unlike any other industrial supply company in the area. We are able to offer up to 2″ 1-6 wire hydraulic hoses to best meet the needs of our customers. Our technicians are highly trained and experienced to meet or exceed the expectations of our customers. This is why we strive to provide same-day service on most of the custom hoses that we assemble at our New Bedford location. When you look at a basic hydraulic hose, you will notice that there are three distinct layers. The various layers provide the means to allow for a consistent and reliable flow of liquid while protecting the exterior assembly from breaking under pressure or as the result of wear and abrasion. The outer layer is made of a very rigid material and is designed to protect the inner layers of the hose. The next layer is known as the reinforcement layer. It is designed to surround the inner tube and is typically made of braided or coiled wire. This layer also works to support the tubing and protect against tears. The final layer is the inner tube, which is designed according to the type of fluid or liquid that it will carry. The goal is to provide free-flowing elasticity and resistance to pressure or stress. The inner layer is usually made from thermoplastic, synthetic rubber, or PDFE/PTFE. Once you get past the three layers, there are also several different types of options for the construction of custom hydraulic hoses. To get the perfect fit hydraulic hose, it is important to provide details on how and where the hose will be used. At Metro Industrial & Marine Supply, we are able to create custom hoses while you wait to provide our customers with same-day service and quality results. Because there is such a wide variety of hydraulic hose applications and the variations of the pressure levels and chemicals that will be used, there are a lot of different constructions available for hydraulic hoses. Reinforced hoses have extra buffers in the reinforcement layer for additional protection, and coiled hoses are designed for easy storage and expansion. Corrugated hoses allow the hose to expand and compress without causing damage to the housing and articulated hoses feature rigid shafts that allow the hose to turn corners or swivel around other components without causing friction. If you are interested in learning more about our same-day services to get custom hoses while you wait at our New Bedford location, give us a call at 508-996-8400 or visit our store on Coggeshall Street. We are proud to offer our customers top quality custom hydraulic hoses to guarantee a perfect fit hydraulic hose for their industrial needs.